​Roofs, Gutters and Soffit, Siding, Fences, Concrete and Landscape Block. We are proud to offer you a surface cleaning system that provides dramatic results to your home. Utilizing powerful 100% biodegradable non-hazardous chemicals, Our soft washing system give you dramatic results without compromising your health or safety. With a 100% success rate over mold, fungus, algae, bacteria and moss, this service will last up to 6x longer than the standard pressure wash! Give us a call (630) 636-6527, send us an at exstreamclean@gmail.com, or Complete an Estimate Form or Book Now. We will take it from there! 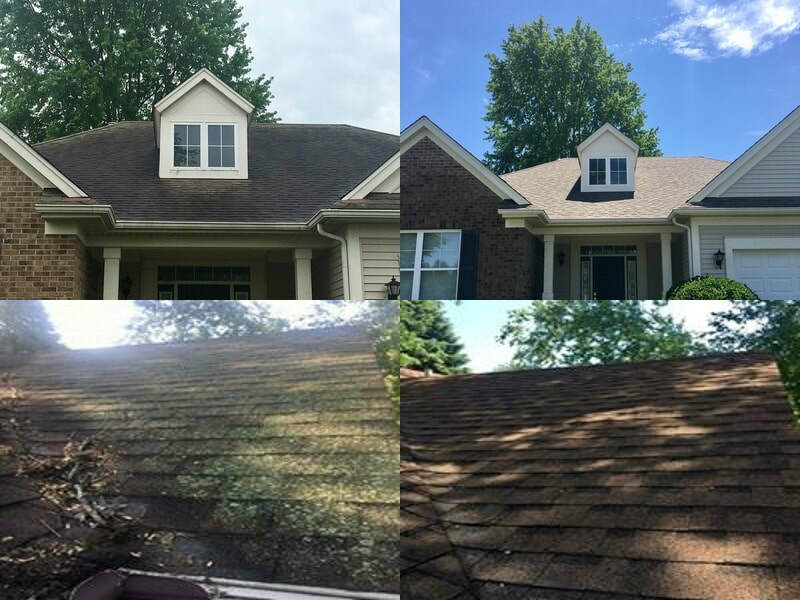 Before and After Roof Soft Wash.
​Soft wash roof cleaning is a low pressure (60psi) process used to remove algae, stains, mildew and lichens. Roof washing is the process to remove dirt, algae and moss from roofs. 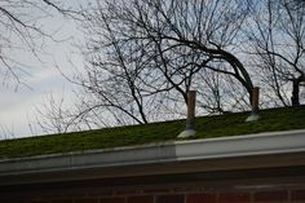 Algae and other types of build-up often form on parts of roofs that are shaded, and can reduce a roof's life expectancy. Our cleaning process is highly effective on all types of roofing material: asphalt, metal, tile, rubber and new composite materials. Give us a call (630) 636-6527, send us an at exstreamclean@gmail.com, or Complete and Estimate Form. We will take it from there! 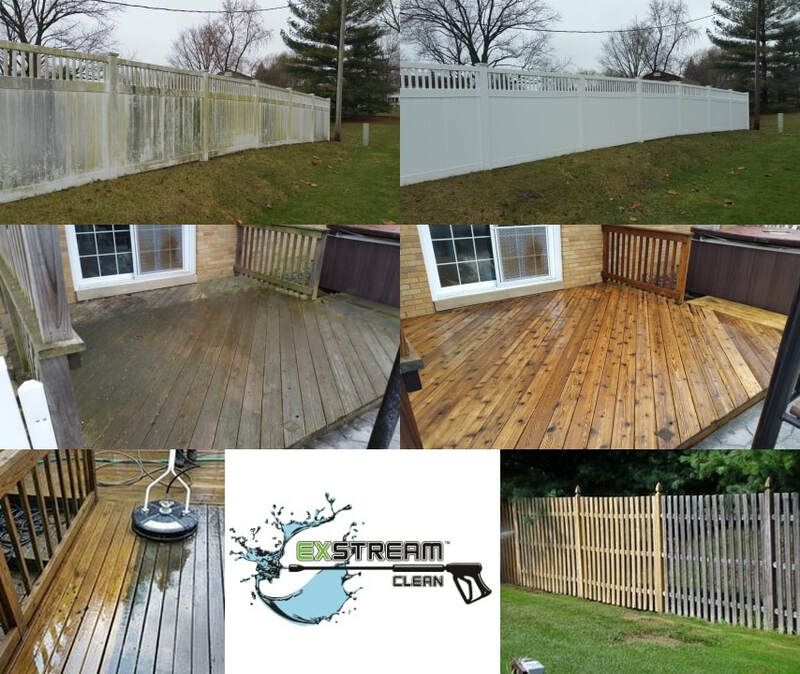 ​We are proud to offer you a surface cleaning system that provides dramatic results to your fence or Deck. Utilizing powerful 100% biodegradable non-hazardous chemicals, Our process gives you dramatic results without compromising your health or safety. With a 100% success rate over mold, fungus, algae, bacteria and moss, this service will last up to 6x longer than the standard pressure wash! 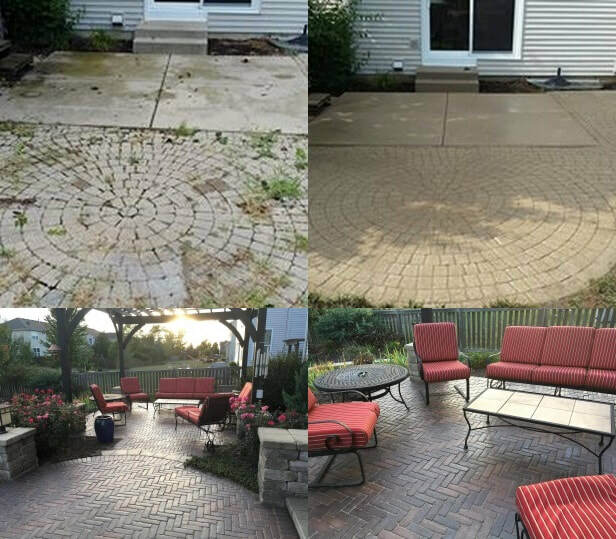 We surface clean, relevel minor areas, and resand paver patios with polymeric sand. Recommended optional service is to seal the pavers to protect your investment! We surface clean concrete and strip sealers with hot water pressure washers and detergents that can take off anything stuck to the concrete. Recommended optional service is to seal the concrete to keep it looking new for years! Did you know the exterior of your gutters can be cleaned too? Over time the exterior facing of gutters and downspouts develop unsightly dark streaks and stains (electrostatic bonding) which can really degrade your home's overall beauty and curb appeal. Gutter exterior cleaning is the prefect finishing touch to our Roof Cleaning or House Washing service! We also will clean the inside of your gutters and downspouts for improved drainage. Get a FREE ESTIMATE NOW!